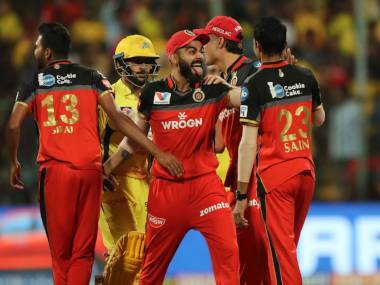 "Mahi maar raha hai, Mahi maar raha hai!" These lines from MS Dhoni: The Untold Story, a biopic on India's limited overs captain, have acquired something of a cult status in the country of late. It gives people a sense of the exhilaration fans feel when a marauding Mahendra Singh Dhoni is at the crease. Sunday night was one such occasion. 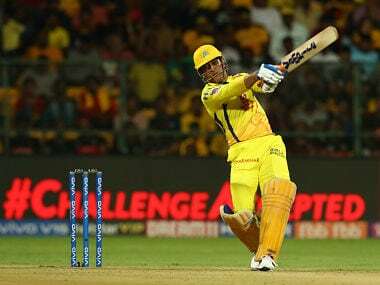 As Dhoni cruised his way to 80 off 91 balls at the Punjab Cricket Association (PCA) Stadium in Mohali, cult dialogue floated around on social media, inside the stands, and on the roads. It brought unbridled happiness to the fans. This was the Dhoni of old — the aggressive Dhoni; the fearless Dhoni; the Dhoni who hit humongous sixes; the Dhoni who pulled off masterstrokes. In the ninth over of the Indian run chase, a Mexican Wave had just begun taking effect among the crowd. But it fizzled out almost as soon as it started, after Tim Southee trapped Rohit Sharma LBW to reduce India to 41/2. However, there was suddenly a huge roar when Dhoni walked out to bat at number four ahead of Manish Pandey. Instantly, chants of "Dhoni... Dhoni" echoed inside the stadium. 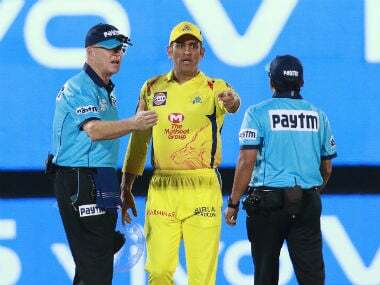 Dhoni has the habit of catching not only the opposition, but also his fans by surprise with his moves, and what followed next was a masterstroke. 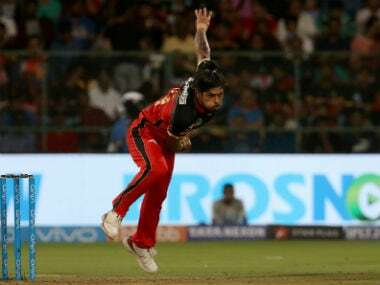 His habit for the last couple of years as limited overs' captain has been to start off cautiously and gain momentum through ones and twos, taking the match till the very end, before going for his shots. This approach has raised questions, especially with his finishing abilities not quite at the same level as they once were. In ODIs, he was struggling for runs; he had gone 10 innings without a half-century. The pressure was building. However, the first ball he faced in Mohali gave a hint of what was coming next. Southee darted in a short ball and Dhoni pulled it powerfully, but straight to deep square leg. It looked like he was in the mood; he was hitting them powerfully. The intent was clear. Earlier, he used to start off with soft hands, rotating the strike before upping the ante with blistering running between the wickets. But on Sunday, his positive intent was visible right from the start. The aggression was palpable. Four balls later, he charged down the track to Southee and just smashed a short one over mid-wicket — this despite Southee altering his length at the last moment. It's just the 11th over of the game, India have lost their openers, and yet Dhoni is playing a high-risk shot. "This isn't the same Dhoni," the mind whispered. He went for another pull off the next ball, but it went on the bounce to the lone fielder on the leg side. The intentions were clear; Dhoni was using his feet and charging down the track to unsettle the bowler. The Mexican Wave was back! Once Dhoni got into the groove, he dealt in singles off the next four overs. The helmet was off for the spinner and back on for the seamer. Mandeep Singh, Jayant Yadav and Dhawal Kulkarni all had a workout, as Dhoni kept using a helmet for every alternate over. At the end of the 14th over, Dhoni called for a bat change. First ball he faced with the new bat, he thumped one over midoff for four, getting on top of the bounce off Jimmy Neesham. An aerial shot over midoff off a pacer in the 17th over? But Dhoni was still only warming up to the task. In the next over, he sent the crowd into a frenzy as he danced down the track and clobbered Santner straight back into the orbit, to bring up 9,000 ODI runs to become just the third wicketkeeper batsman to do so. The assault continued in the next over, as he crunched a pull through square leg off Neesham to bring up the 50-run stand with Kohli. Neesham and Santner were both on Dhoni's radar. When Kohli reached his 50 in the 20th over, Dhoni was on 32. By the 28th over, Dhoni was in the lead. In that time, the skipper had clobbered Santner for another six, smacked Matt Henry through point for a four, reached his first half-century in 11 innings, and hammered Neesham straight back for a six by dancing down the track. He also overtook Sachin Tendulkar's tally of most sixes by an Indian in ODIs and thumped Trent Boult through square leg for his eighth boundary of the innings. Ah! This was the Dhoni fans had missed. All this while, Kohli was playing second fiddle, sensibly. The Kiwis tried the short ball strategy and tried having the wicketkeeper stand up to fast bowlers as well, but nothing was working against a Dhoni who had found a good rhythm. By the 32nd over, Kohli looked a bit tired, but Dhoni still looked fresh — a testament of the senior partner's fitness over the years. In the 33rd over, Dhoni seemed to have twitched something in his leg while running a quick single. He hobbled a bit, and the physio came out at the end of the over, but Dhoni sent him back. The way he keeps wickets and the agility with which he runs between the wickets is enough proof of his fitness, even at 36 years of age. He brought up the 150-run stand with Kohli with a straight shot over Henry's head. Sushant Singh Rajput, the actor who played Dhoni in his biopic, was in attendance, and was enjoying every moment. It all came to an end a ball later, when Dhoni chipped one straight to short cover off Henry. There was shock, but the crowd recovered in a flash to give him a standing ovation before erupting into chants of "Dhoni... Dhoni". Of the 151-run stand, Dhoni contributed 80 and Kohli 66; the former had scored 47 off 52 balls off Neesham and Santner combined. The hallmark of Dhoni's innings was his straight hitting. Of the 80 runs he scored, 43 percent were scored in the 'V'. His cautious starts had given way to a fearless approach. His first 35 balls yielded 30 runs at a strike rate of 85.71, which is the joint-highest for him in the first 35 balls of ODIs since 12 October, 2014. In the 2015 World Cup match against Australia, he had scored at a strike rate of 85.71. The last time he scored faster than this in the first 35 balls of an ODI was against West Indies in New Delhi on 11 October, 2014, when he scored 37 off the first 35 balls with a strike rate of 105.71. After this, he played 10 more ODIs (excluding Sunday's match) in which he faced more than 35 balls, but he did not better his strike rate of 85.71. Which says a lot about the mindset change. Dhoni explained his approach after the game. "Going at No 4, it was important to play the big shots. It was the first inning I played (at this position) and I got runs, but it's not easy to come out of it. I could have taken a few more innings. So, it's good I got runs," Dhoni said in the post-match conference. "At the same time, it gives a chance to some of the youngsters to bat lower down the order and see as to what really needs to be done, how calculated they need to be. There is one way of chasing which is hit, hit, hit, and ultimately you achieve the target. Often on slower wickets, that is quite difficult to achieve. So I feel it's good for everyone, personally for me, since I go out there and am not looking too much into what needs to be done. I am instead looking to set the pace of the game, and quite a few opposition captains put fielders inside (the circle), and I am still looking to pierce the field. I can play the shots over the fielder and I feel that was what was needed in my batting. Today was the first day and I am hoping to continue with this," Dhoni added. It's a good move, and like we had argued previously, it needs to become permanent. The captain explained how the move helped him play freely. "The important thing was to go out there and express myself. It was something that I wanted to do for a long time, but if you are batting at No 5 or 6, and your top order is batting brilliantly, you don't get the chance to bat how you want to," he explained at the post-match conference. "Often, you will get in with 10-12 overs left, and are trying to slog, trying to get as many runs as possible. Or you're out in the 20th over maybe, where you have lost five wickets and you go into bat looking for a partnership. If it keeps happening for a long time, the tendency is that you don't rotate the strike fluently. It was happening with my batting." Knowing there aren't many batsmen to follow was a factor that played on his mind, Dhoni admitted. "When you know there's just one batsman after you, you consider a lot of things. You have to be close to 90 percent sure all the time when you are setting out and are looking for a big hit. It all becomes more result-oriented. But if you're only two down, you can go out there and play the big shots, and that is what I did when I went in. It was important for me to start with a positive intent. As I said, it was taking a bit of risk. I mean in the first I played I could have got out, but that is the risk you can afford to take if you are batting at No 4. With more and more games, I will keep getting better and that's what is important for me," Dhoni added. While Kohli's masterclass powered India past the finish line, it was Dhoni's masterstroke that rolled back years. His innings at the PCA has provided hope. A hope that Mahi maar raha hai can still be a recurring theme going forward.